You are here: News / Competition LIKE, SHARE & WIN !!! Competition LIKE, SHARE & WIN !!! 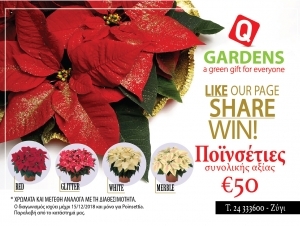 http://shaelosplants.eu/wp-content/uploads/LikeShareandWinPoinsettia2018.jpg 937 1245 Koulla Shaelou http://shaelosplants.eu/wp-content/uploads/logo-300x252.png Koulla Shaelou2018-11-15 15:16:382019-01-23 16:34:05Competition LIKE, SHARE & WIN !!! Proposal of the month – Chrysanthemum Competition!! !LIKE, SHARE & WIN!! !